Back to the studio. This week I’ve been working with acrylic mediums. For those who aren’t familiar with acrylics, the various gels, pastes and liquid mediums allow for shapes and color to be applied in various glazes and textures. This also allows for lettering on and between layers. For more detail click on the thumbnail. This is a 16×16 canvas collaged with unpainted double shuen. It was then covered with a layer of white wash so that when it was dry I could use water media to write and also to allow me to impress letters into the surface. If you look closely at the detail below you’ll see small block letters rising like bubbles from the sea. There are more collaged papers giving the illusion of fish. 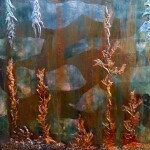 The raised “seaweed” was created with gesso thinned with matte medium applied with a squeeze bottle. The illusion of sand was created with mica gels. 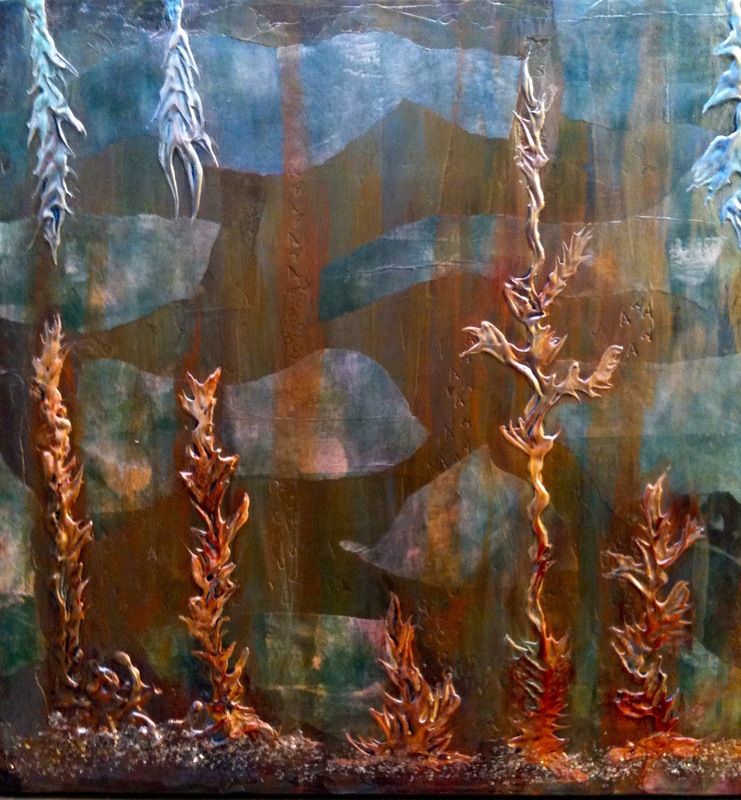 The various layers of color are acrylic glazes. I’ve posted the work here before any lettering is applied so that you can see the underlying structure more easily.